Suggested donation of $25 adults/$15 students 18 or older. Youths 12-17 come free. This workshop is appropriate for all people and of any discipline — beginners through advanced students. 1. Standing Meditation: Zhan Zhuang, Standing Like a Tree, a standing meditation that’s initial goal is to relax and release all the tension in your body. This method cultivates the body’s natural energy called chi — a simple practice with extraordinary mental and physical benefits. 2. Healing Science: Chi Gung (qigong) is a holistic system of coordinated body posture and movement, breathing, and meditation used for the purposes of health, spirituality, and martial arts training. 3. No Mind: This is a mental state called mushin in Japanese and wuxin in Chinese. Zen and Daoist meditators are said to reach this state, along with disciplined artisans and trained martial artists. They practice this mental state of emptiness, free from attachment, during everyday activities. There will be sessions with Andrea who will offer a Sound Healing Meditation using Tibetan bowls and a Guided Sitting Meditation. Besides sharing these mental, spiritual, and physical refreshments we will also provide a fusion of snack and beverage refreshments during break. *VOLUNTEERS NEEDED: We need a few volunteers to help us with set-up and break-down, check-in desk, refreshment service/clean-up, etc. Contact the volunteer coordinator for the program, Jennifer Becher at jennifer@newarkmeditation.org to apply as a volunteer before registering for this program. Khalil Maasi is a lifelong student and practitioner of meditation, mindfulness, martial science and it’s related integrated systems of knowledge. To understand the fruit, you must understand the root. And the root in this paradigm is Khalil’s father, well-renowned meditation and martial arts Grandmaster Shaha Mfundishi Maasi. He teaches under Shaha Maasi’s tutelage their family system known as Moyo Kazi (Energy Work) through their organization The School of Heaven and Earth which is based in Baltimore, Maryland. Moyo Kazi is a system of Chi Gung (internal martial healing science) developed and based on the study of internal healing martial traditions from around the world. Khalil is also a initiated Yoruba Priest (Minister) in the traditional African/Nigerian spiritual system of Ifa (Isese) and is an associate Minister at The Ifa Temple Of Light in East Orange, NJ. 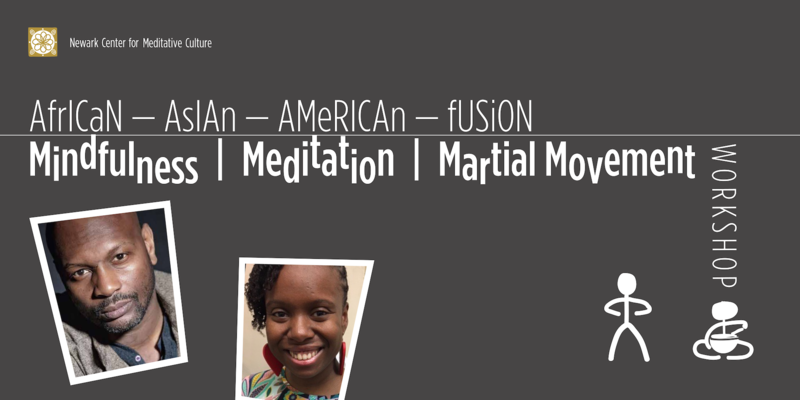 Khalil often teaches the African connection to these practices during his classes and workshops. As well, Khalil is a certified child assault prevention counselor in the state of New Jersey working primarily in the Newark and Essex County school system. Andrea Lee is a Preschool Assistant Teacher at Montclair Cooperative School in her hometown of Montclair, NJ. She is an intern organic farmer at Rabbit Hole Farm in Newark where she resides. She is a senior disciple of Reverend Jaganath Carrera, Spiritual Head and Founder of Yoga Life Society. She recently completed seminary training and was ordained a Yoga Life Minister. She is a certified Yoga instructor and performs Kirtan with Mirabai Catherine Moon. Andrea is founding Treasurer of NCMC where she also instructs in meditation and mindfulness and provides yoga and chanting sessions. Newark Center for Meditative Culture is a 501(c)(3) non-profit organization. A program of Newark Center for Meditative Culture. This entry was posted in Ancestral Domain, Breath Meditation, Dao, Meditation, Meditation Day Retreat, Part-day Retreat, Qi-Gong, Self-Care, Spirituality, Tai-Chi, Tao, Uncategorized and tagged #meditation, #newarknj, chigung, Dao, emptiness, healingscience, martialart, martialmovement, mindfulness, mushin, qigong, soundmeditation, taichi, Tao, tibetanbowl, wuxin, zhanzhuang. Bookmark the permalink.